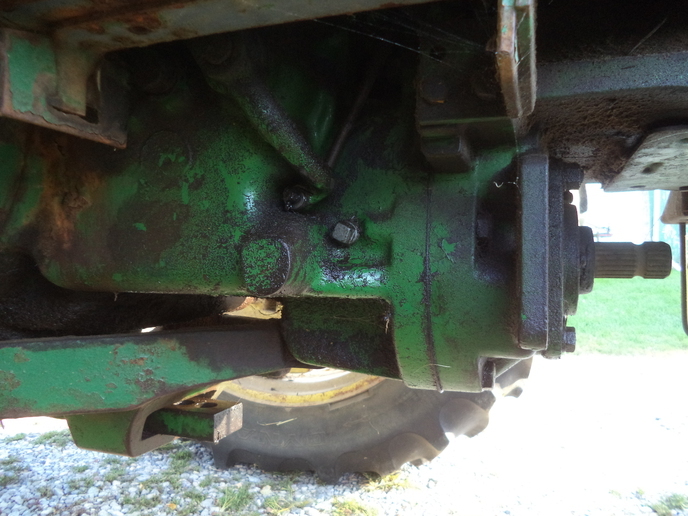 on an earlier post, I explained how I replaced the internal PTO shaft pin, that had sheared when the cap screws on the 540 spline stub shaft came loose while mowing hay. I did not split the tractor. As it turns out, there is a 3/4" pipe plug in the right side of the transmission. I drained out the fluid, pulled the plug and I could see exactly where the pin can be inserted. The hole must have been drilled and tapped by a mechanic who knew where the pin was, from other work. Working thru the hole, I replaced the $2 pin. Pretty simple actually. Good luck all and thanks to whoever figured this out. By the way, I live in York County, PA. The tractor came from the Cuba City, WI area, according to a sticker on the hood. Fascinating. I'll have to remember that if that ever happens to my 4010 again. So, here is how: I put one of those small white Christmas tree lights in the hole to light up the inside without blocking the hole. I used a small parts grabber, put grease on the pin, turned the shafts by hand to line up the holes and inserted the pin. I rolled the shaft 1/4 turn, inserted the cotter pin the same way. Rolled the shaft a little more. Then pushed a screw driver between the halves and twisted. I used a small magnet on a telescope shaft to fish out the broken pieces. It was actually pretty easy. As I mentioned in the first post, just finding the plug proved someone had done it before. Just curious, did you split the tractor? Thanks for posting the photo. I'd still like to see a video of the pin being replaced & installation/spreading of cotter key. I have done that before. It is tedious work but doesn't take long if everything goes right. There is actually a service bulletin from Deere that shows where to drill the hole. Maybe someone with access to old service bulletins could look it up and post it. You are now qualified for to do heart bypass surgery ! Wow that is a tiny hole to do all that work thru. Glad to know it is possible if I ever get one.